Visitors to the Gallery are permitted to take photographs with hand-held cameras and mobile devices for personal, non-commercial use. All other uses require prior permission from the Registrar. Press image enquiries should be made to the Marketing Officer. Geelong Gallery respects artistic and intellectual property rights. Many of the works displayed at the Gallery are subject to copyright legislation. The artist/copyright holder retains the right to reproduce a work of art. 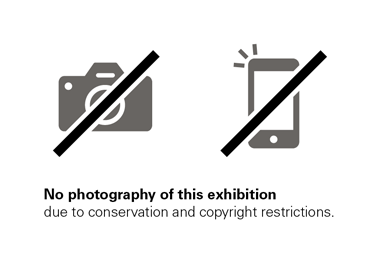 No image, documentation or sound recording displayed at the Gallery or appearing on the Gallery website may be reproduced, communicated or copied without permission, other than for the purposes of research or study. Use of and referral to this material is allowed for the purposes of research or study so long as full and proper attribution is given. For Indigenous works, this may include the artist and community. Unauthorised commercial publication or reproduction of any part of the Geelong Gallery collection is prohibited. It is your responsibility to obtain permission from the copyright holders or their agent before a reproduction of any work or any other content is made. Not adhering to these conditions may constitute an infringement of copyright which may incur penalties including nes. The Gallery cannot assist in getting any permission you might need. The Australian Copyright Agency’s Viscopy may be able to help, see viscopy.net.au. If you wish to reproduce any works displayed at the Geelong Gallery or which appear on the Gallery website, you should rst contact the Registrar, who may be able to supply you with the conditions and costs that may be associated with your request.